Today's project is yep, another canvas. Actually I've had this one in the wings for a while waiting for a good time to share it. There are quite a few types of media and techniques used here as I explore and try to find a style. Who knows, maybe I don't HAVE a style because I haven't found a particular one yet! 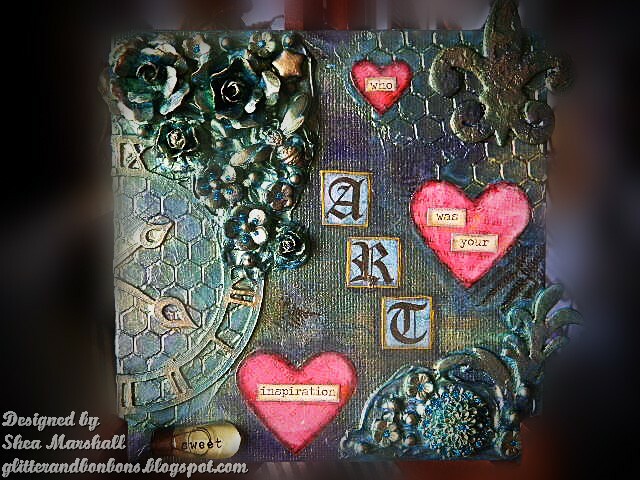 I've used stamping on tissue (the ferns which are mostly covered up), molding paste put through a chicken wire stencil, decoupage and 3-D pieces pressed into more molding paste. Then everything is painted with one of the most gorgeous paints with which I've ever had the pleasure to work, that being Lumieres Halo Blue Gold. It goes on blue and green, and the more you brush it, the more gold appears. Paper roses, smaller paper flowers, glass flower beads, a glass star bead and a metal bee pin are all placed in a mound of molding paste. Pearls are sprinkled here and there and everything is painted with the blue/green paint. 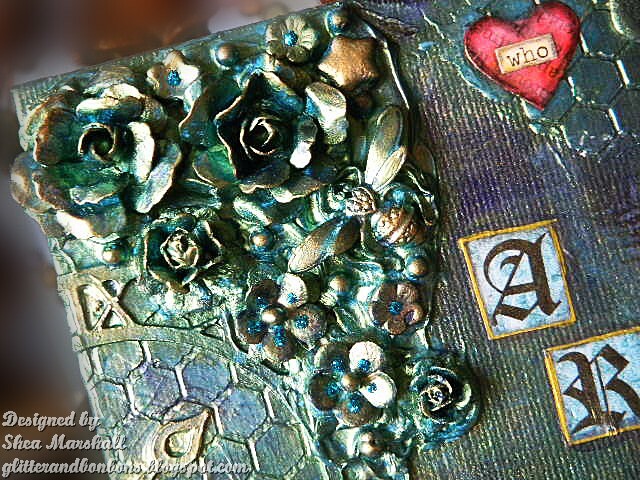 A chipboard flourish, more glass flower beads and pearls, and a resin flower. I've used blue Stickles for the bits of sparkle here and there throughout. The hearts were cut from book pages and shaded with a charcoal pencil. These letters are outlined with a gold paint pen. 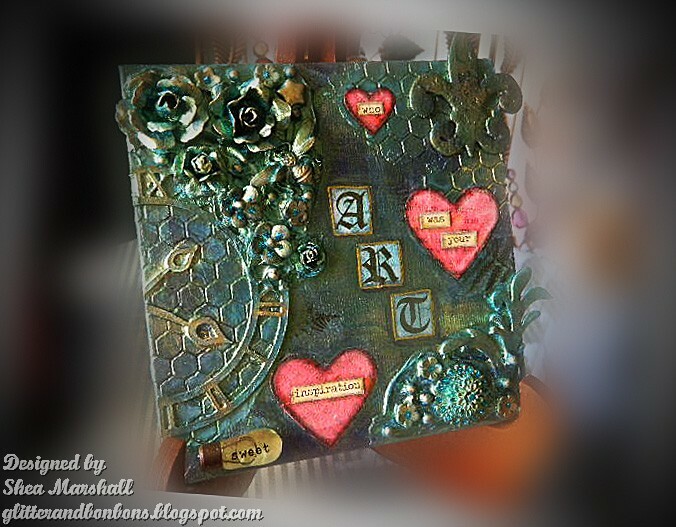 All of the dimensional pieces, once painted with the blue/green metallic paint, were also rubbed with gold Rub 'N' Buff. It really makes the dimensional pieces stand out further. 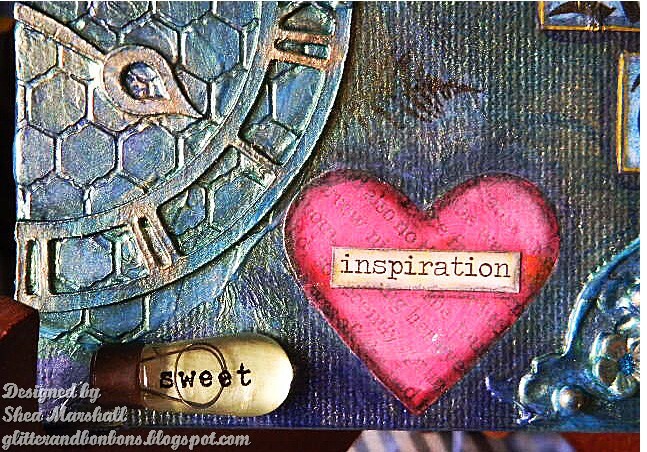 Thank you lovely readers for joining me today on my journey to figure out what I want to do with mixed media. 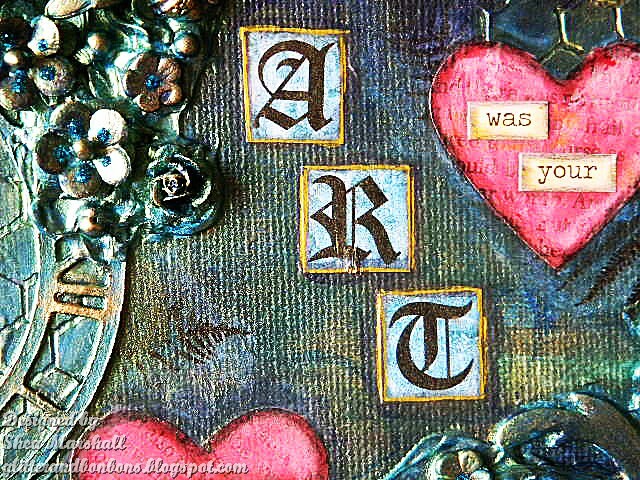 It truly is an exciting art form which encourages one's imagination to let loose! I love this - absolutely stunning art. You are right about the paint - gorgeous. 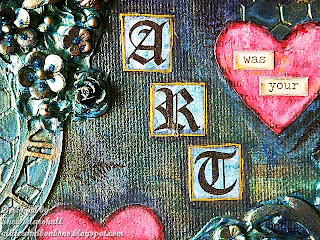 Thank you for sharing with us Altered Eclectics. Hope you become a regular participant. This is fantastic! 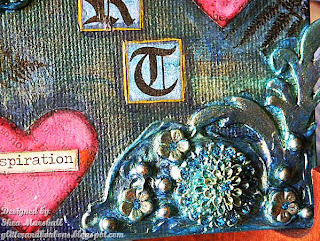 I love all the textures you've got in it and the colours are gorgeous! Thank you for playing with us at Eclectic Ellapu! Oh, I love these blue / green colors. And the flowers are fabulous! I want to try doing some flowers like that. Very beautiful. Wow...I so love this canvas.Love all the elements and the colour palette is lush. 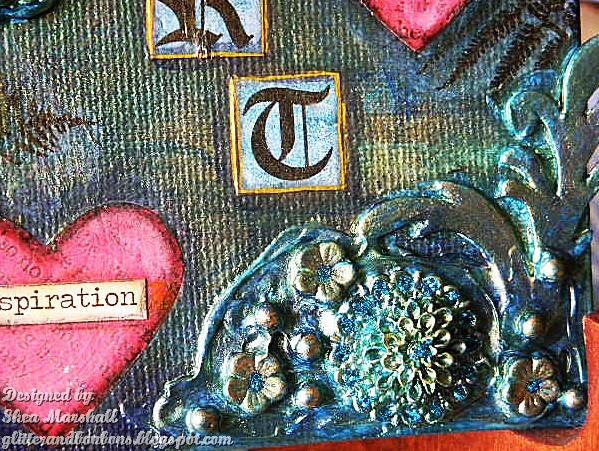 Thank you for entering our challenge over at Altered Eclectics. So fun. Love the colors! Mwah! Wow! Great job on your canvas. Just started dabbling in them myself. Your work is gorgeous. Thanks for joining us at Eclectic Ellapu! Wow - this is awesome! Love the colours!